Getting a Haworth office chair is one of the best things that you could do for yourself. Their chairs are slightly pricey but they are so comfortable, long-lasting and stylish. If you work long hours, you need a comfortable, ergonomic and durable office chair. Your search stops right here at the Haworth brand name. It is easy to tell a Haworth office chair from the rest because of their unique style and outstanding design. They have quite a variety of chairs. Thus, it is possible to find a chair for just about any budget or for any need. When you have to sit for long hours on end daily, then you know that you need the best office chair. 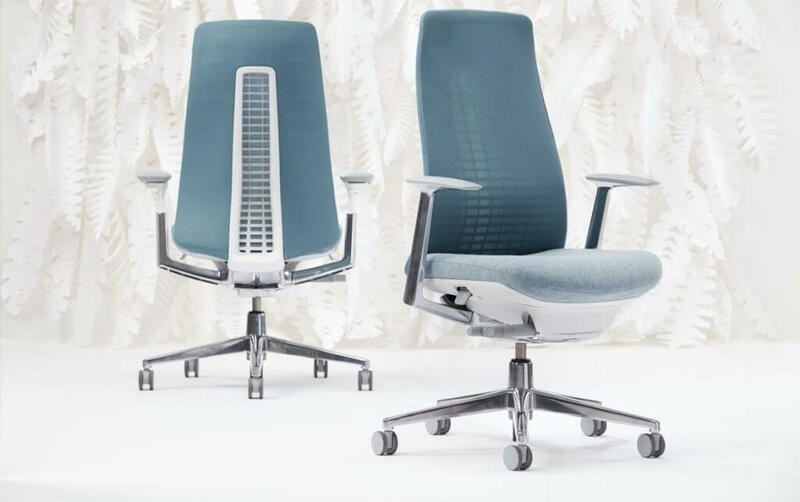 If you are a Haworth diehard or you are hearing about this brand for the first time, it is the one-stop center for all things office chairs. They have affordable, expensive and moderately expensive office chairs. Ok, compared to brand names such as the Autonomous office chair, you might find these chairs a bit on the high side. However, you know the price is not too high if it can be justified by the features. Standard office chairs are not much good when it comes to staying comfortable in the office. Sometimes, you just want to work with peace of mind, knowing that you are not compromising your back health. Haworth has got the answer for you. Haworth was wounded way back in 1948. Over 70 years of making the same product is enough assurance that any Haworth office chair is worth the money. You can order your chair of choice with confidence, knowing that you will get good value for your money. In this article, we are going to review just five of their flagship products. The Haworth Soji office chair is made for people looking for affordability more than anything else. However, it does not mean that affordability is the only thing good with this chair. It packs most of the features that the highly priced chairs. If you need an office chair to safeguard the health of your back and you can only afford so much, this is the best chair for you. Who says office ergonomics have to be costly? In this chair, you will see that indeed, sometimes, what you want is always within reach. One of the features that people love about this chair is its flexibility, versatility and adjustability. It is a fully ergonomic office chair and it will help you safeguard your back health. When they say that Soji brings mind, body and functionality together, they mean it. When you sit down on this chair, you will love its effectiveness and all round comfort. The synchronization of mind and body is the perfect recipe for increased productivity at work. Just by looks alone, you will see that Soji is a very elegant, stylish and good-looking chair. Wherever you will place this chair, it will bring an incredible transformation. The support that you will get from this chair is so effective, yet at the same time quite humble. What we mean by this is that the armrests are nice, stylish and supportive. The backrest is quite ergonomic and gives good support to your back. However, the Soji office chair does this without being boisterous about it. Since this is an all-round adjustable office chair, you will love that it adjusts effortlessly. You do not have to do much. Just a touch of a lever here, a knob and a button there and the chair will rise, lower or recline so smoothly. Many office chairs have been made, but few will ever have this kind of effectiveness and affordability. To meet the diverse needs of many people, the Soji office chair is made with many colors. From frosted mint, Loch Lomond, Arctic Flame, In The Navy and other color combination, you have got a product that is made to be loved. The comfort of the chair is enhanced by the meshed back, which increases airflow. It is also has a comfortable seat. When you sit down, blood circulation to your lower limbs is not affected in anyway. Besides, the seat edge of this Haworth office chair is so comfortable. You do not feel it pressing against the back of your knees. Finally, the chair has in-built lumbar support. It is so simplistic in design. However, it is very effective. You can position it nicely to offer maximum comfort to your lower back. With an endorsement from the American Physical Therapy Association, what more convincing does anyone need to buy this chair? Besides, it is an award-winning chair. As you will see when you buy it, every iota of praise for this chair is justified. This chair took a lot of research to develop. In fact, it is a product of combined efforts of the Haworth Design Studio, the Human Performance Institute (University of Michigan) and ITO (a German firm). This chair is made of recycled materials. That is why it won the gold certification from Cradle to Cradle. As you comfortably sit down in the office, you may not care about it, but you will be doing Mother Nature a good turn. This is a nicely fitting office chair that has been made to meet the posture needs of large-framed as well as small-framed people. Some of the features that make it so adaptable include the forward tilt of the backrest. If you are a petite person and you somehow cannot fit in the chair, you can “bring the backrest” forward to meet your back. Incredible lumbar support is assured. There is a pelvic support pad added to the chair to ensure just this and much more. Thus, when you sit down, the pad accommodates your lower back very well, leaving you feeling relaxed throughout the entire sitting and working experience. The armrests are 4-D adjustable. This means that they can be adjusted in 4 dimensions. While this is a pretty standard feature in chairs within this price range, well, it is a good deal altogether. You can slide the armrest pads forward, backward, raise or lower the height of the armrests. You can also pivot them inwards of outwards to increase or decrease your sitting area. The backrest is designed in such a way that when you sit down and lean back, it leans back, giving you just the right amount of tension for your back. If you are heavy, or petite, the meshed backrest will accommodate you very well. It will distribute your weight evenly. The warranty given for this chair is confidence inspiring. One, there is a warranty of 10 years on the casters and the seat mechanism. That is quite something. Basically, you can say that you will get a limited lifetime warranty on parts and workmanship. Like the other chairs under this name, the Zody Haworth office chair is also available in different colors. Bold and neutral colors are perfect for offices and boardrooms. The bright colors are good for your home office. Fern is a fantastic name for an office chair. Is it because the spine of this chair reminds one of a fern? This is without doubt one of Haworth’s bestselling flagship products. It is a culmination of posture science, human improvement, body and mind synchronization. Sitting on such an office chair brings about one of the best synchronization of your psyche, functionality and health. From a glance, you can tell that this is a frameless chair. Well, it may not be exactly frameless, but it has no edges to it. However, one thing that you will love about the chair is that it is lightweight. At the same time, it is also quite adjustable, allowing the user to tweak it here and there until they find their best sitting posture. There are no hard edges on this chair to worry about. Most chairs that have hard plastic edges press into the skin of the users. Edges also add to the weight of the chair, as we have discussed in the paragraph above. Just remember that you will be buying into excellent work because the fern design has been patented. These “fern” leaves are designed in such a way that they correspond with particular parts of your back. This chair has adjustable armrests. You can adjust them outwards/inwards, forward, backward and lower them or raise them. In addition to the adjustable armrests, the general height of the chair can be adjusted easy. Just touch the lever and the pneumatic rod rides up or down. You do not even have to rise fully from the chair. 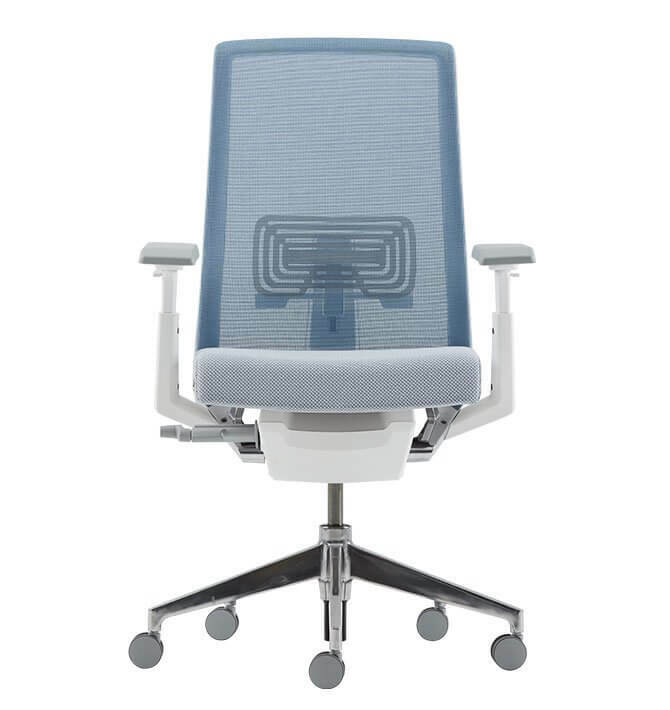 The lumbar support for the Haworth Fern chair is adjustable. You can raise it or lower it depending on where you feel you need the support most. That is not all because the backrest is quite flexible to accommodate any weight put against it. Thus, when you sit down and lean back, the backrest distributes your weight evenly. This is important for preventing knotted muscles from long hours of sitting down. You can tilt the backrest forward if you are too petite to reach the back of the chair comfortably. Besides, depending on the task at hand, you may find the need to tilt the backrest forward from time to time. 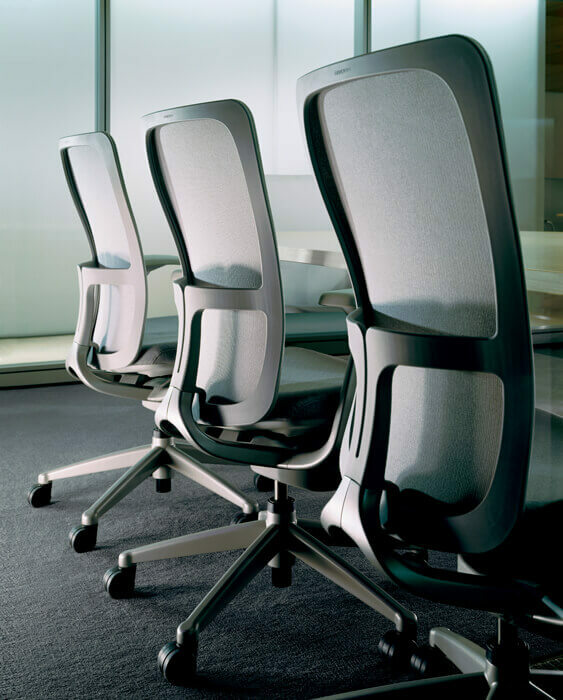 The patented Wave Suspension system has enabled Haworth to make these simple-looking but very advanced office chairs. The incredible Haworth chair design has been extended to the Very task chair. This chair is made to meet the posture needs of different users. It has a wide range of adjustable features. With this chair, you can revolutionize the way that you sit down in the office. You will find that this chair has many accommodating features. One of them is the Wave Suspension technology that keeps the backrest flexible. Most office chairs have a rigid backrest, but this one gives way when you sit back. Thus, even if you have more weight, the backrest will accommodate the weight rather than resist it. This chair is made with as many recyclable materials as possible, getting it a Greenguard certification. Thus, if you use it, you will be glad that you are doing something nice for Mother Nature. From the looks though, you will be forgiven for thinking that this is just another Zody. However, there are some differences. This chair has been designed with asymmetrical lumbar support that you can adjust up or down, left or right. Just listen to your body to know where you need the lumbar support most. This lumbar support is also adjustable individually to the left or to the right. What this means is that you can adjust the lumbar support to the left without affecting the right side. Another common feature that you will love to use is the 4-way adjustable armrests. They can pivot outwards, rise or go low, slide backward or forward. 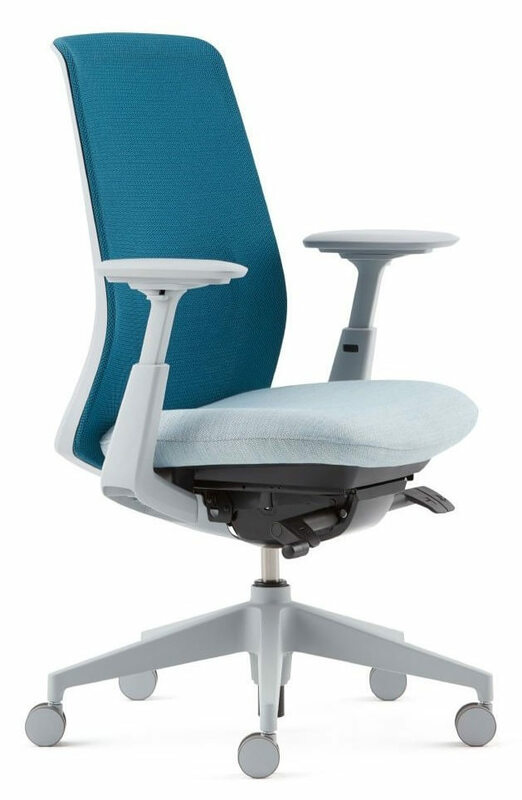 From this Haworth office chair, you can also get to use the forward tilt. This is very helpful when you want to lean forward a bit to work on your computer and still stay supported. 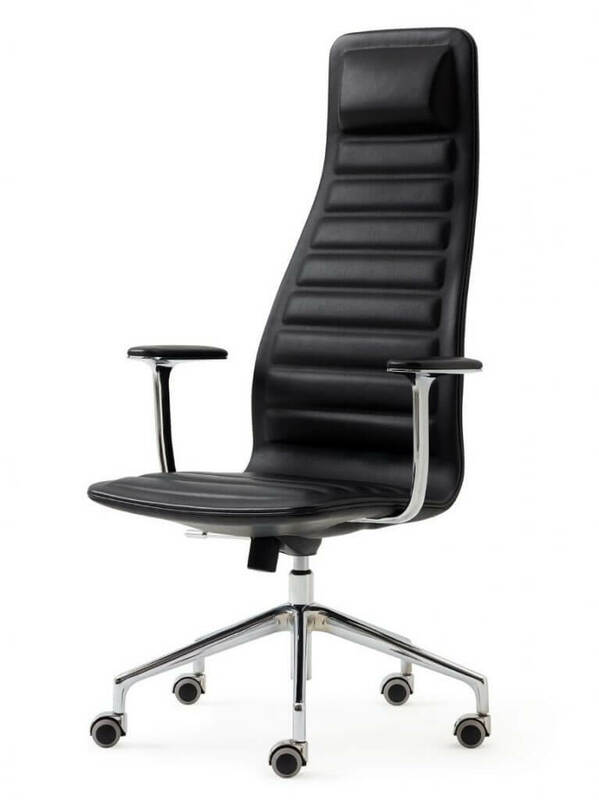 This, coupled with features such as adjustable seat depth makes this chair a worthy investment for any office. For comfort, the meshed back is very breathable. There is enough airflow and so there is no risk of developing a sweaty back as you work in summer. The seat is also breathable and very comfortable. You can sit on this chair for long hours without feeling uncomfortable or compromising your back health. This chair is mostly known for its incredible style and the choice of the materials. This is a high back chair with a contoured backrest. It is also a very expensive chair, retailing at more than $2000 in most online marketplaces. Even if you choose to buy the one without armrests, it is still a costly piece of work. It comes in a very slim design. If you look at it from the side, you will wonder whether it can really support your weight. Well, it will support your weight and for tens of years to come. The high back also serves as the headrest, an option that we have seen missing in many of the Haworth chairs. The seat is seamlessly designed to last as long as possible. At the same time, this chair is quite breathable, enhancing your comfort throughout the day. Well, many people can only ogle at the chair as it is above the price range of many people. However, getting hold of one of these chairs can help you carve a little heaven for yourself right there in your office. These are just five of the best Haworth office chairs. We have looked at the cheapest one, and at the most expensive one. There are other options of office chairs under this name, some with armrests, some without. There are also stools and desks to match with your Haworth office chair of choice.